I’m always looking for good and healthy alternatives to the not-quite-so-healthy alternatives that I have to east since my body can’t really process the lactose in dairy. Dairy and I have all but broken up for the most part. It wasn’t an easy break-up either…but something had to give. For awhile now, I’ve been purchasing vegan versions of cream cheese from Tofutti and Daiya. And these worked. They double as a cream cheese alternative, minus the actual dairy. Texture works. Tofutti tastes just like cream cheese. Daiya tastes like…Daiya…as pretty much all Daiya products do…but still amazing. These have been staples in my fridge since I found amazing gluten-free bagels (Udi’s, Canyon Bakehouse, and now Sweet Note) and have made a few attempts at making my own gluten free bagels. But then…one day while in Whole Foods, I saw something new. Something…different. Kite Hill was started due to a vision for a plant-based food that would have all the qualities we love in the best artisan dairy cheeses. Using simple ingredients and using traditional methods, Kite Hill has created artisan cheeses, yogurts, and cream cheeses that can all be incorporated into entrées and desserts. Created by a dedicated team with deep culinary, cheese-making, and scientific expertise, including Tal Ronnen, Monte Casino, Jean Prevot, Pat Brown, and Matthew Sade, Kite Hill has stepped up to the challenge to create a non-dairy cheese that met their high standards for quality. So often, vegan cheese tastes fake or plastic-like. After years of recipe testing and countless trials and errors to develop the perfect nut milk, cultures, and enzymes needed to create a worthy product, Kite Hill emerged on the market place. And then…my weekly stop in at Whole Foods. I went early, because my allergen-free bakery wasn’t open yet. This allowed me time to sip on coffee from my local coffee shop and just roam, see what I normally would blow past because I was trying to miss the crowd or just in a hurry. There, over with the cheeses…I saw it. Kite Hill products galore. Something new!! Something vegan! Something I knew I wanted to try. I had places to be that day, though, so I couldn’t stock up. A few trips later, I still hadn’t tried it. 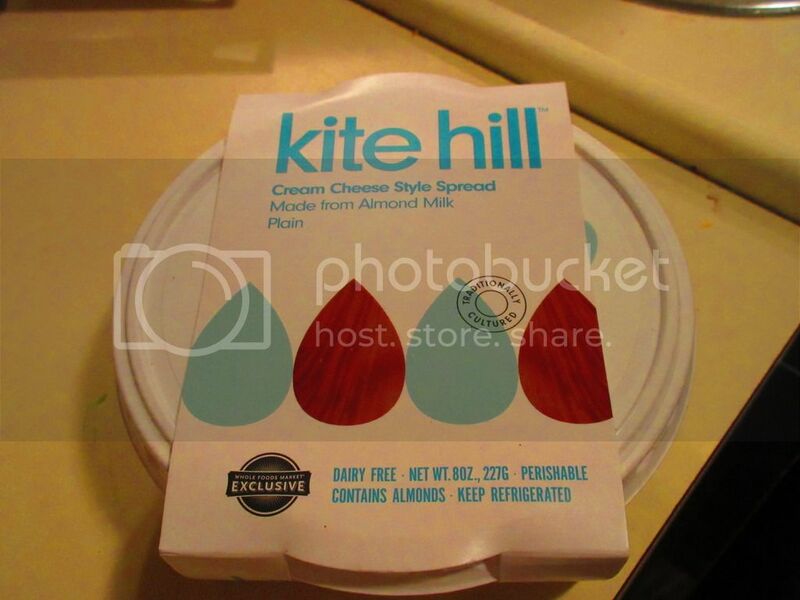 So, one day, my roommate just surprised me with a container of the Kite Hill Cream Cheese Style Spread. I was SO excited. While there are two varieties (Plain and Chive), she had started with the plain…because…it’s the original. The classic. I had to polish off the container of Tofutti Better Than Cream Cheese that was in the fridge before tackling this…but this morning, the packaging was ripped off. It was time to try Kite Hill for myself. I had toasted up the amazing Sweet Note Bakery Gluten Free Plain Bagels (go to their Web site…order them…STAT!) this morning. 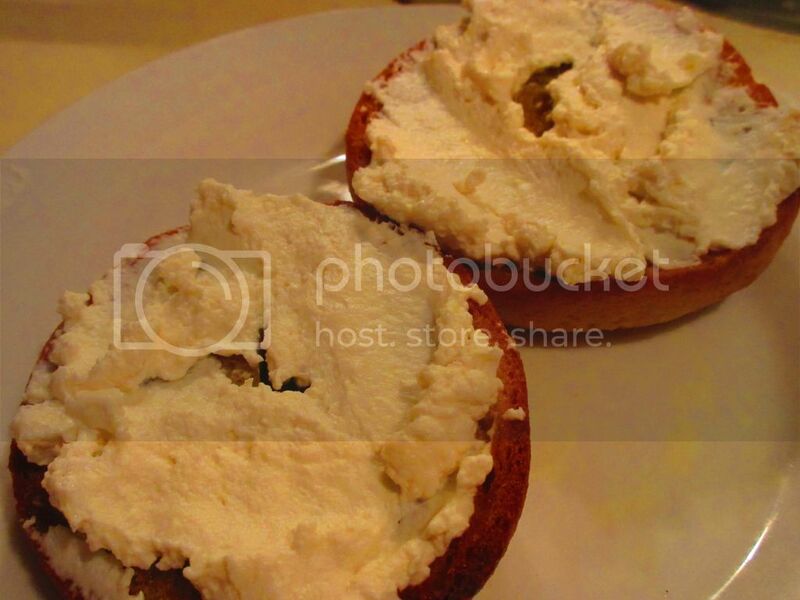 And, in true New York Bagel style…I needed my hefty schmear of cream cheese on top of each half. I lifted the lid and pulled back the plastic, revealing this soft and creamy spread. I thought it looked a little more like ricotta cheese than cream cheese. I scooped up a serving size and placed some on my roommate’s bagel and then some on mine. First of all…I loved how it was all light and fluffy. Straight out of the refrigerator, it was the perfect texture to immediately spread on the bagel. No need to battle it out with a knife. This was smooth as (dairy-free) butter. The texture was very ricotta cheese like. It had this faint bit of sweetness…almost like a cottage cheese, without all the gross lumpy bits. The flavor was very light…not quite like you expect cream cheese to taste…(Tofutti has honestly been the closest on the flavor that I have tried)…but it worked. It worked brilliantly. I fell in love with it at first bite. The smooth, light, airy texture was the perfect complement to a dense, New York style bagel. It was harmony on my breakfast plate. I don’t want to ever have another brand again. This was it for me. Pure love in every bagel-y bite. Not sweet, but not savory…a perfect balance. One of the biggest draws to Kite Hill is their ingredient list. While Tofutti and Daiya both have a lot of added fillers like ground nut pastes, stabilizers and artificial ingredients to make their cheese-like products, Kite Hill’s cream cheese spread is made from a short list of real ingredients. We’re talking clean cheating…er…eating at it’s very best. Kite Hill Plain Cream Cheese Style Spread is made from almond milk (water, almonds), salt, enzyme, vinegar, xanthan gum, locust bean gum, guar gum, and cultures. That’s it. It is soy-free, vegan, dairy-free, contains no saturated fat, trans-fat free, cholesterol free, and gluten-free. Is this love or is this love? And I am also loving the nutrition facts as well. A serving size of Kite Hill Plain Cream Cheese Style Spread is 1 ounce (28 grams)…or about 2 tablespoons. There are 8 servings per container. One serving will provide you with 78 calories, 7 grams of fat (keep in mind this is made from almonds, so this is actually a healthy fat), 170 mg sodium, 2 grams carbohydrates, 0 grams dietary fiber, 0 grams of sugars, and 3 (yes…3!) grams of protein! When compared to the other, more commonly found, vegan cream cheeses out there…hands down, this one wins the nutrition and ingredient prize! So, if you’re ready to turn your gluten-free bagel up to eleven…then you need to get to your local Whole Foods (yes…Kite Hill is only available at Whole Foods) and find this brand ASAP! Now that I’ve tried it, I can’t wait to taste the other cream cheese and artisan cheese offerings that Kite Hill has to offer. Beyond impressed. I’m completely converted. Forget the rest…Kite Hill is best. Really…it is. But you should try it for yourself. So…go on…Whole Foods awaits. This entry was posted in Bagels, Breakfast, Cheese, Clean Eating, Food, Gluten-Free, Nuts, Products, Review, Spreads, Sweet Stuff, Vegan, Vegetarian by The Celiathlete. Bookmark the permalink. Thanks for posting this. I found Tofutti disappointing. Is this just available at Whole foods? As far as Tofutti….it is my roomie ‘ s favorite and the only one I can find anywhere in a pinch. I prefer Daiya…but now Kite Hill has my heart. I would love for you to check out Red Lotus Foods out of Cleveland. We are not producing in a dedicated GF facility, but do use our own equipment. Your discovery was so similar to mine. I’m in love! I had to go to another store to shop this week and they didn’t have the Kite Hill cream cheese nor did they have my favorite Sami’s Bakery bagels. Meh. I have to go out of my way or else! I just recently discovered this, so I am way behind the times! It is definitely the best on the market!! I’m so glad that this product is now available at Publix! I had one today and it was AWESOME! Have you tried it baked, like in a casserole? I did it, I put it in a casserole & baked it! The casserole instructions said to dollop the cream cheese all over the casserole. Dairy cream cheese would melt down. This does not melt. It still tasted amazing, just next time I’ll do smaller dollops. Otherwise you can end up with a huge bite of just cream cheese. It was still delicious! This is very good information to have!! Thank you!! Glad you tested it out. For those who have the grocery store “PUBLIX” they sell it too. Here in South Florida it is $4.49. Delicious!